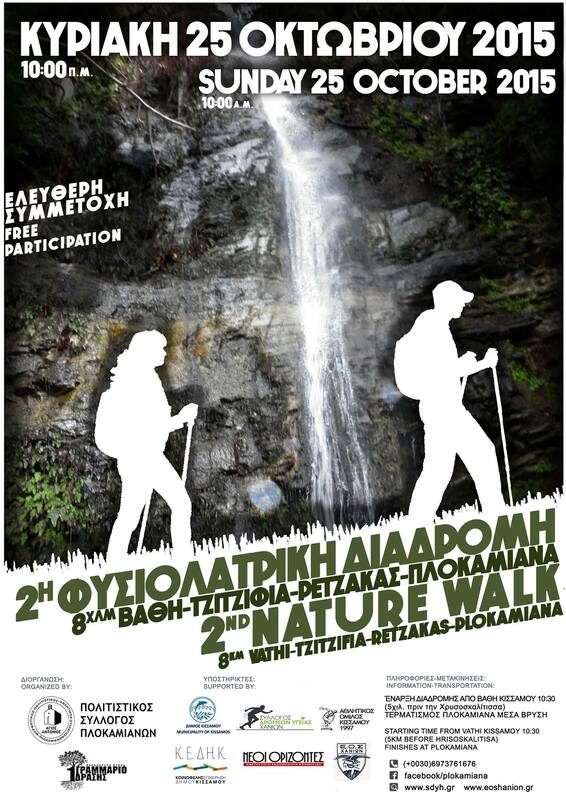 1.Meeting and starting point at Vathi Square (5KM before Xrissoskalitissa – Elafonisi) at 10h00AM. 5.Ends at the Mesa Vrisi (Inside Tap) at Plokamiana , where there will be a barbeque and drinks on sale, with the proceeds going towards supporting the organizing club. (All participants will receive a commemorative participation diploma). 6.It is vital that all participants have a bottle of water, good walking shoes, a jacket and a walking stick. A.If you have your own transport, it will take about an hour from Chania or 30 minutes from Kastelli. B.From Chania, there is a bus that leaves at 08h00AM from the start of Tzanakaki road, where the Bank of Cyprus used to be. The bus returns to Chania later in the afternoon. C.From Kastelli, there is a bus that leaves at 09h00AM from the Town Hall Kastelli. Greek in spirit. Recently adopted, with whole family, by Kissamos. Sea and nature lover. You will receive a weekly digest of Kissamos events and news. Copyright © 2019 Kissamos News. All rights reserved.